When Sheriff Timothy Whitcomb visited his co-worker and leukemia patient Undersheriff William Nichols in the hospital earlier this month, he wanted to do more than just cheer up his comrade. His solution? 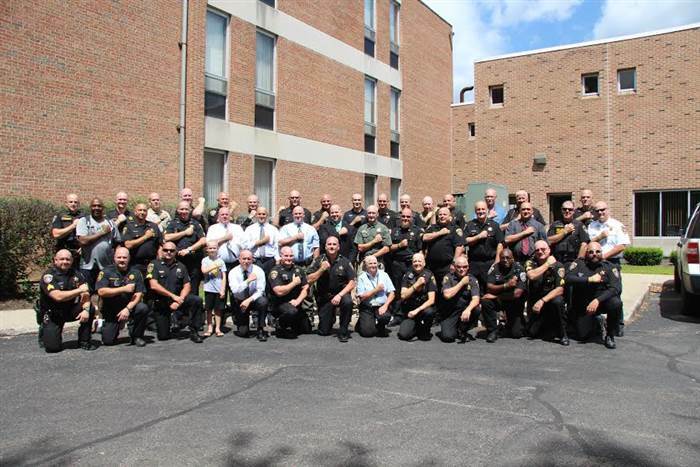 Get some of their fellow deputies at the Cattaraugus County Sheriff’s Office in New York to show their support for Nichols by shaving their heads. Talk about a buzzworthy idea. Nichols has had leukemia for approximately five years. After visiting with Nichols, Whitcomb sent a memo to office staffers encouraging them to donate to Roswell Park Cancer Institute in Nichols’ name, and he also invited employees to shave their heads to honor their colleague. “Several members of our agency have already committed to this by unifyingly coming together symbolically and joining in Bill’s fight with leukemia,” Whitcomb wrote in the memo. What no one expected was for nearly 50 members of the sheriff’s office, including two women, to go bald for the cause. The group posed for a picture, which was then delivered to an emotional Nichols.